Wake up Jeff! Love the way he makes my kids laugh. We love Anthony. He’s the funniest at all the concerts. Always smiling! 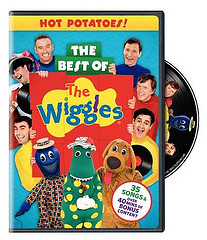 My favorite Wiggle… is Anthony. He’s talented, athletic, a great dancer, great musician and fun! Anthony is our favorite too!! It is a toss-up between Jeff (how cute is a character that falls asleep?) or the very goofy and never scary, Captain Feather Sword. They both make me smile as non traditional characters. Captain Feathersword! Today, my 2yr old came up to me, and Ahoy there Mommy!! Nearly died laughing. We loved Greg but since he left another favorite is wacky Jeff! So, I really would like this dvd for my daughter. Since we don’t have cable she hasn’t really met the Wiggles. My son LOVED them. I love the Fruit Salad song, I sing it all the time.